Yazoo (known as Yaz in the U.S.) were formed in 1981 by vocalist Alison Moyet and Depeche Mode songwriter/synth player Vince Clarke. Known as Yaz in the U.S., the duo had their biggest hits in the UK Charts in the early 80s. 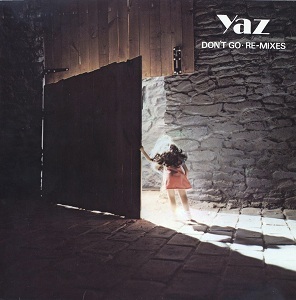 "Don't Go" was the follow-up to the debut single Only You and peaked at No.3 in the UK Singles Chart. It was taken from the album Upstairs at Eric's, which peaked at No.2 in the UK Album Charts. Yazoo's only other studio album was You and Me Both, which topped the UK album charts in 1983. The B-side to "Don't Go" featured the track "Winter Kills" (4:02). In the U.S., the single spent two weeks at the top of the American Dance Chart during Oct 1982. In the video, teh setting is a spooky house of horror which features all the classic elements from old horror films such as a skeleton, cobwebs and Vince as a mad scientist in a white coat. The couple certainly appeared to have a lot of fun, at least. Sadly, shortly before the release of You and Me Both, Vince Clarke and Alison Moyet announced they were to go their separate ways.